All of us are becoming increasingly aware of the effects that our choices have on the environment. At Javaworks, we strive to make a difference by offering eco-friendly products to our customers. We do this by aligning ourselves with companies that believe in sustainability, and companies that produce 100% recyclable products. Combine this with best in class coffee and break room solutions, and we’re confident to provide you a world class, eco-friendly and ECO-nomically savvy business solution. Call us today to get details about our Go Green, Save Green program! 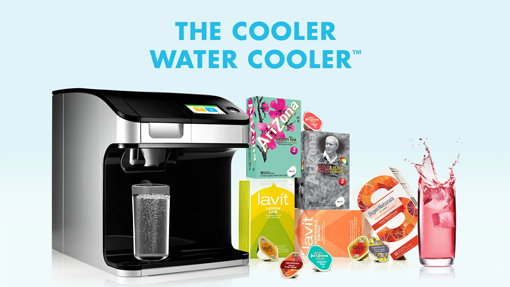 With three settings (ice cold, still, or sparkling), recyclable aluminum capsules, and low-calorie, preservative-free drink options, Lavít represents a bright new future of the single cup cold beverage world: satisfying cravings while promoting beverage options that with great taste using natural sweeteners. Each favor capsule uses one-seventh of the aluminum required to produce a 12 oz. soda can. In addition, a portion of the proceeds Lavit generates goes towards providing communities in need with safe, sustainable water sources through One Drop. Click below to learn more. 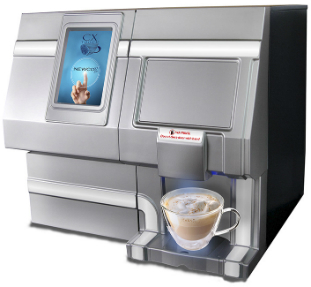 Built with the future in mind, the NewCo CX Touch is rated the #1 single cup brewer on the market per the Specialty Coffee Association – From traditional coffees to flavored coffees, espressos, cappuccinos, mochas, lattes, hot chocolates and hot teas the CX Touch will bring barista experience to your office. We pair this machine with award-winning Wolfgang Puck and Reunion Island lines to offer a full assortment of fully-compostable coffee/tea pods to prepare beverages free of plastics like many other single cup systems. There has been additional awareness brought to the concerns about BPA and other harmful chemical contents being a byproduct of the brewing process when using single cup systems that use plastic capsules (Kuerig, Flavia, Tassimo). 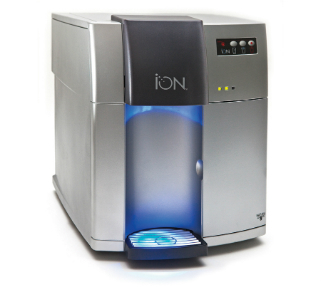 The CX Touch is revolutionary as it eliminates all plastics which is better for one’s health and our environment. Click below to learn more. Introducing the single best way to include cream in your coffee service. 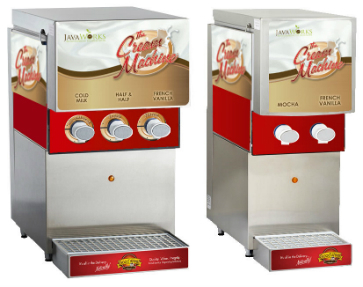 This machine is environmentally friendly, reduces waste, eliminates the potential for pilferage and offers healthy, chemical free, American made, 100% fresh and natural cream at the touch of a button. Best news is…it costs less per ounce than any boxed/capsule creamer on the market, we guarantee it. See link below for me detail. Americans bought 50 billion bottles of water last year, 38 billion of which were not recycled. With Javaworks’ point of use water purification systems, you’re always guaranteed freshly filtered water that never sits stagnant in a plastic container and has no impact on the environment. Many of our clients have transitioned over from the 5-gallon jug systems and found them to be much more convenient and aesthetically pleasing. A healthy life begins with clean, healthy water; it doesn’t get any more basic than that. Looking to alleviate all those empty chip bags? How about alleviating your concern over too many prepackaged snacks walking out the door but still want to provide your office with a nice accouterment? Our bulk snacks program is the answer! 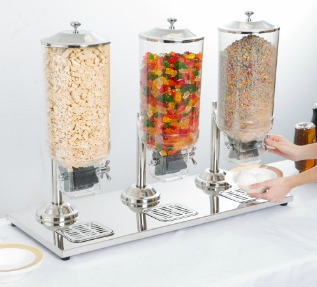 We offer dozens of snack types and flavors that dispense from our beautiful, easy to use, gravity fed dispensers (available in single, double or triple canister). We pair the dispenser with some small cups to provide an easy way to provide the perfect complement to your office. Best news is this option looks better, tastes better, eliminates pilferage and lowers the “per snack” cost approx. 40%!